AKG’s new luxury cans represent a big step up in quality from their previous flagship design. The role of headphones in music production is changing. It used to be that they were really the domain of the live room, selected for their resilience, ease of service and affordability, with sonic purity playing second fiddle to quantity and familiarity. Their role on the other side of the glass has traditionally been confined to creating cue mixes, listening for edits, or checking for compatibility with the ubiquitous Apple earbuds. Never generally treated as a serious monitoring solution, they do tend towards a rather odd sense of perspective in comparison to loudspeakers, and most people, myself included, would not want to have to rely on headphones alone when mixing. But as the industry moves away from highly specified, purpose–built environments, as budgets dictate that some, or all, of a project may be undertaken in smaller, private studios that lack the benefit of exemplary acoustics, we are starting to see a new, more significant role for headphones. Because although these sorts of spaces are often equipped with superb nearfield monitors, the limitations of rooms that were never designed for acoustic perfection make accurate monitoring extremely difficult to achieve. This is particularly true of the low–frequency end of the spectrum — you can’t install effective low–frequency absorption in a small space; there isn’t enough room. Equally, there may well not be space, or indeed budget, for a set of larger, full–range monitors in addition to the nearfields. So it’s in these sorts of scenarios that good–quality headphones are finding their niche as a means of obtaining a more reliable sense of the crucial low–end balance. As their value as a production tool increases, so too does the budget we’re prepared to set aside for them, and in recent years products whose price previously set them squarely in the ‘hi–fi’ camp have found their way into the world of recording. This trend has not gone unnoticed by AKG, who have developed their latest pair of ‘no compromise’ open–backed reference headphones, the K812, specifically for audio professionals. They may be marketed as a studio product, but they come with a hi–fi price tag. So how do they compare, not only with their competition in that price bracket, but also with their more affordable siblings in the AKG catalogue? AKG say that, “The K812 superior reference headphones offer the most pure and natural sound possible,” and that they allow music professionals to experience the “smallest sonic details with the most accurate balance for mixing and mastering...” As always in these situations, there’s some special technology cited to convince us of these claims. The headphones feature an unusually large (53mm) transducer, developed from scratch by AKG to ensure “highest–in–class headroom and dynamic range”; a 1.5 Tesla magnet system, providing ‘highly accurate imaging’; and an ultra–lightweight two–layer voice coil giving us a “superior impulse response and extended frequency range” (quoted as 5Hz to 54kHz, although there’s no indication of how flat, or not, the frequency response is between those figures). The K812’s arrive in a black, fabric–covered flip–top box, held closed by a gently magnetic front flap. They sit in a shaped foam recess, accompanied by their stand. A folded card box contains the cable, a warranty document, and a product pamphlet. The headphones themselves are really rather elegant. As you’d expect from AKG, the immaculate powder–coated die–cast aluminium, perfectly stitched edges of the headband, and combination of polished and brushed metal accents in the design give these headphones a clean, sophisticated, yet understated appearance. They’re like the inside of an Audi. 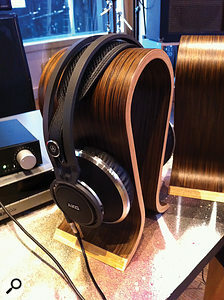 This is beautiful design for which AKG should be commended, but it’s not all for show. They feel light, and thanks to an excellent mesh headband assembly and a unique ‘3D’ ear–cup design, they’re extremely comfortable — far more so than a lot of their competition. They don’t quite float on your head in the way that the Sennheiser HD800’s do, but they have a feeling of sealing around your ears that those can’t match. You feel like they’re firmly, but very gently, taking hold of your head and delivering the music. The ear cups have just the right amount of give. They’re not spongy but they don’t leave gaps in awkward places, and there’s plenty of room for your ears inside — I don’t like it when headphones pretend to be circumaural but then leave inadequate space inside the cups, and there’s none of that here. The headband is comfortable and easily adjusted. They’re every bit as nice in the flesh as the glossy pictures would have you believe. The cable attaches to the left side via a LEMO connector. Some people prefer headphones to have separate branches of the cable for each side, but I don’t personally have a strong opinion either way. At least if it’s just the left you instinctively know which way round they go when you pick them up. It’s quite difficult to locate the tell–tale ‘L’ and ‘R’ markings on these (it turns out they’re discretely printed on the inside of the headband adjustment plate) but because of this element of the design you don’t need neon markings an inch high to guide the way. With the exception of the LEMO connector, the cable is fairly typical of what we’re used to with AKG headphones. It’s thin, three metres long and terminates in a 1/8–inch stereo jack with a threaded outer rim, onto which screws the standard 1/4–inch jack adaptor. A hi–fi enthusiast would probably take issue with the cable itself as being flimsy, but I’ll just say that I wonder what the advantage of the 1/8–inch jack is on a headphone that’s designed for high–end mixing and mastering. The familiar screw–on adaptor design is good enough and I’ve never personally found those to fail, but it just seems a little at odds with the ethos of the design. These headphones take quite a lot of driving (more on that later) and besides, you’re probably not going to be running them off your iPhone at the gym. Of course, talk of 1.5 Tesla magnets and 53mm transducers is only of extended interest if you’re a keen headphone designer. Most people will be more concerned with the question of what this money buys in terms of sound. And the answer is quite a lot — they’re really very refined indeed. I was able to compare them directly to the cheaper K712 Pro, as well as some high–end models by other manufacturers. The K812’s are a significant improvement on the previous AKG model. They are supremely detailed, open and free from any sort of confusion, compression or distortion. When confronted with heavily over–compressed modern pop they were able to reveal those compromises clearly, rather than compounding the problems in the way that many lesser headphones do. The K812s ship with an attractive, if slightly impractical, wooden stand.Like all AKG headphones they are bright. This contributes to their extremely revealing nature — I could hear buzzes and noises that were just inaudible on my speakers and some other headphones. But they did also feel brighter than the speakers, and a potential mixer or mastering engineer would need to be familiar with them to allow for that trait. The bass was solid and deep, making the K712 Pro’s sound a little blurry and indistinct in the bottom end by comparison. I didn’t quite get the realism in the bass that I experienced from the Audeze LCD–X planar magnetic headphones that I compared them to, but those are significantly more expensive and aren’t quite as revealing as the K812s, with their crystal clear and extended highs. The depth, clarity and imaging all represent a substantial improvement over AKG’s previous models, worthy of the expense for those that can afford it. There are some issues to be aware of here. On first listening to the K812, my impression was that they were spitty; harsh even — this is a headphone that needs a period of burning in. I’m not one of these people who believes that everything needs to be burned in, but these do, and they need quite a bit of it. I left them playing CDs on repeat for several days over the course of working with them. As mentioned above they’re always bright, but over time that unpleasant edgy quality disappeared to leave a refined, clear brightness that will be rewarding, if that’s your thing. There’s no mention of this on AKG’s web site, or in the accompanying documents, and there should be, or some people will send them back, which would be a shame. Secondly, you need a decent headphone amp here. Not only do these take a bit of driving, but they’re also rather revealing as discussed, and the sound of a cheap headphone amp at full strain is not going to deliver the distortion–free, uncompressed result that’s on offer here. For this review I used the amp built in to my Dangerous Monitor ST, as well as an SPL Phonitor Mini. Both delivered excellent performance, but I would advise against relying on a built–in headphone amp in a cheap mixer or interface, for example. The K812’s are open–backed. This type of design typically delivers a more natural result than closed–back equivalents, but comes with a side–effect — everyone within 20 metres can hear what you’re listening to. For those that are looking for something to use on the train or plane, this is not going to be it. It’s absolutely not a criticism, it’s just worth being aware of if you’re not used to open–backed cans. There are however some things about this product that I wish were different. The K812s ship with a shaped wooden stand — a sort of head–like outline on which they’re supposed to sit when idle. AKG suggest that this will prolong the life of the ear pads by keeping them in their optimum shape. Now some people might like that — they might like to have them sitting on their desk on their weird head — but for me it’s just something I have to find somewhere to put. I take on board the comment about the ear pads, but this is supposedly a studio product, while the stand has a distinctly hi–fi feel about it. It’s also made of wood, which, while attractive in its own right, is rather at odds with the high–end European car vibe. I wonder if there’s another option here — something that clips on to the edge of a rack or desk, for example. On a similar note, the box isn’t appropriate for this product. It’s a fibreboard box with a magnetic flap which doesn’t have any means of proper closure. It’s not robust. If I need to take my thousand–quiddollar headphones to another studio for a session, I don’t want them in this. Audeze, for example, offer a Pelicase–type box with the more expensive models in the LCD range, and while I wouldn’t expect this cheaper product to ship with something like that, it could be a cost option. At the very least, the headphones should ship in a basic moulded plastic case. Again, this is supposed to be a studio product; we don’t need black velvet, we need some protection. If it were up to me, I’d lose the stand and have a high–quality case instead. So what have AKG given us here? A beautifully designed, comfortable and refined–sounding pair of headphones, that represents a significant step up in relation to their previous high–end models. If you like the AKG family sound, these compete well in their price bracket and are worthy of further investigation. Box and stand not best suited to studio use. AKG family sound may not be to everyone’s taste. 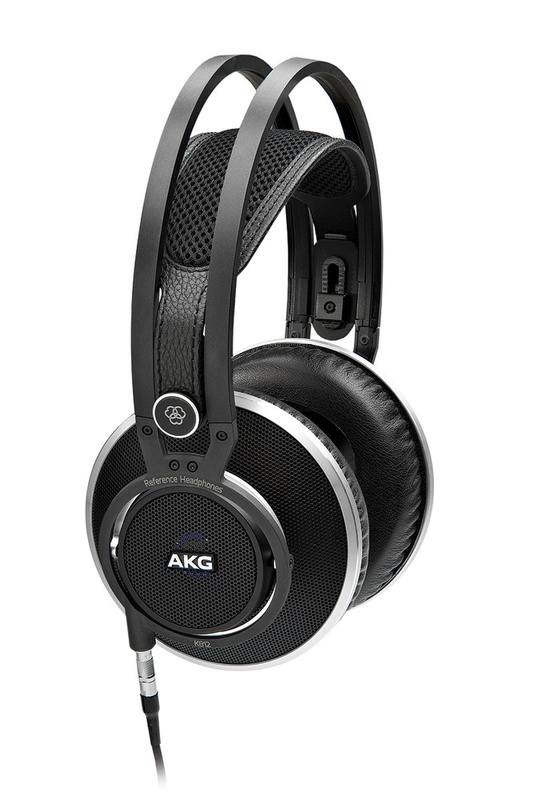 A significant improvement on AKG’s previous flagship headphones, the K812s are refined, revealing and comfortable.